An excerpt from this piece was published in our winter newsletter in December 2018. Now that leaves are falling, the giants are revealing themselves in the forest. No, not the fairy tale variety—the trees. Walking the Schuylkill Center’s trails in the summer months, they remain mostly hidden from view. They’re tucked away from sight, obscured by cork trees, devil’s walking stick, and their own young. But once the crisp fall days arrive, the giants appear. The largest trees on the property are mostly tulip poplars, lone wolves that grew up when the land was still being tilled. These trees are recognizable from their wide branching form, which demonstrates the open growth of their youth when there were no other trees around competing for resources. 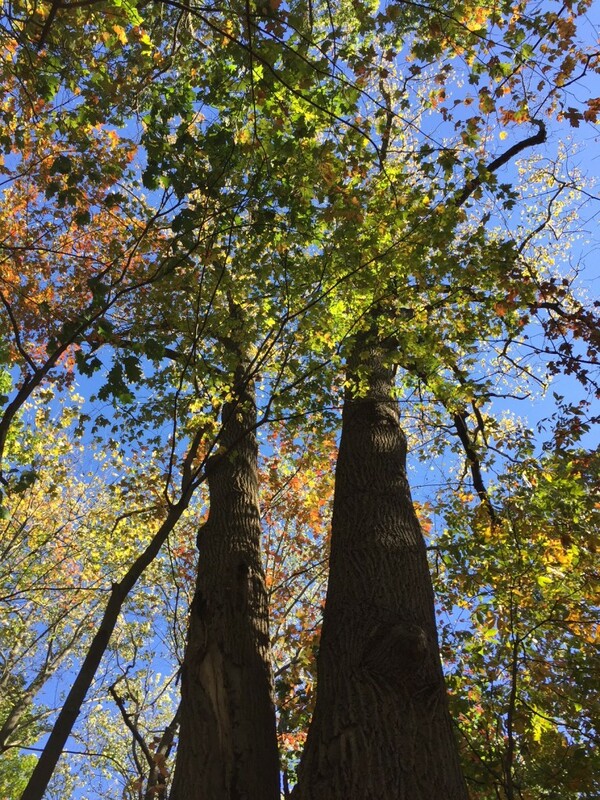 The most sizable specimen is a stately, multi-stemmed silver maple located on Grey Fox Loop. Other majestic species of notable size include sassafras, white and red oak, American beech, and sycamores. Well on their way to achieving seniority are several red maples, growing larger every day in spite of pests, disease, and climate change. How will our giants of the forest fare into the future? It’s hard to say for certain, but we have lost a few already. In the summer of 1974, a survey of the giant trees of the Schuylkill Center located 57 notable trees. The ones that are now gone include an American elm, a crack willow, two red oaks, three American beeches, one white oak, and one white ash. Many more tulip poplars have survived and thrived since then, however their life expectancy maxes out at around 150 years. If the largest of these trees are already 100 years old, how many more years will they survive? In the not too distant future, the giants might be gone. Now is the time of year to come enjoy them and marvel at their grandeur. Let’s take a moment to consider the world they came into and the one from which they’ll depart. Get to know these forest dwellers better at our upcoming Giants of the Forest tour on January 20th. Andrew is the Manager of Land Stewardship at the Schuylkill Center. He has a master’s degree in landscape architecture and ecological restoration from Temple University, and runs the Center’s biannual Native Plant Sale. 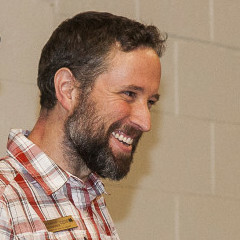 He hiked the Appalachian Trail from Georgia to Maine in 2005–2006. This entry was posted in Land Stewardship. Bookmark the permalink.